How are human societies changing the global environment? Is sustainable development really possible? Can environmental risks be avoided? Is our experience of nature changing? This book shows how questions about the environment cannot be properly answered without taking a sociological approach. It provides a comprehensive guide to the ways in which sociologists have responded to the challenge of environmental issues as diverse as global warming, ozone depletion, biodiversity loss and marine pollution. It also covers sociological ideas such as risk, interpretations of nature, environmental realism, ecological modernization and globalization. Environmentalism and green politics are also introduced. Unlike many other texts in the field, the book takes a long-term view, locating environmental dilemmas within the context of social development and globalization. 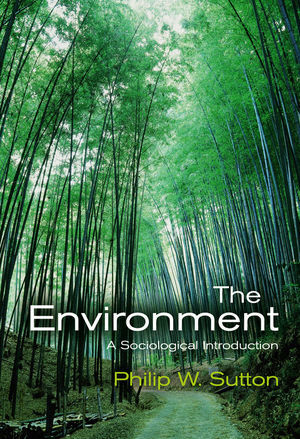 The Environment: A Sociological Introduction is unique in presenting environmental issues at an introductory level that assumes no specialist knowledge on the part of readers. The book is written in a remarkably clear and accessible style, and uses a rich range of empirical examples from across the globe to illustrate key debates. A carefully assembled glossary and annotated further reading suggestions also help to bring ideas to life. The book will be a valuable resource for students in a range of disciplines, including sociology, geography and the environmental sciences, but also for anyone who wants to get to grips with contemporary environmental debates. "This is in every way an excellent textbook." "This book is an excellent introduction for students new to this area of inquiry and should enthuse them to deepen their investigation of some of the most important issues of the 21st century." "Phillip Sutton has crafted a systematic and thorough introduction to the social science of the environment: its definition, transformation, politicization and defence. He expansively charts the emergence of the field and points to how global changes and politics will affect its future. This book will become a key resource for new students of environmental sociology and a point of engagement for future discussion." "Philip Sutton combines an excellent introduction to the sociology of the environment with an innovative approach to the field. A stimulating and wide-ranging text." "Written for undergraduate students, Philip Sutton’s The Environment demands no prior knowledge of sociology. Remaining faithful to its subject matter, the book ranges freely across human and environmental sciences. Sutton rejects the “retreat into the present” that characterizes much contemporary sociology and frames environmental problems in relation to very long-term processes of human social development. This “sociological introduction” is challenging in all the right ways."